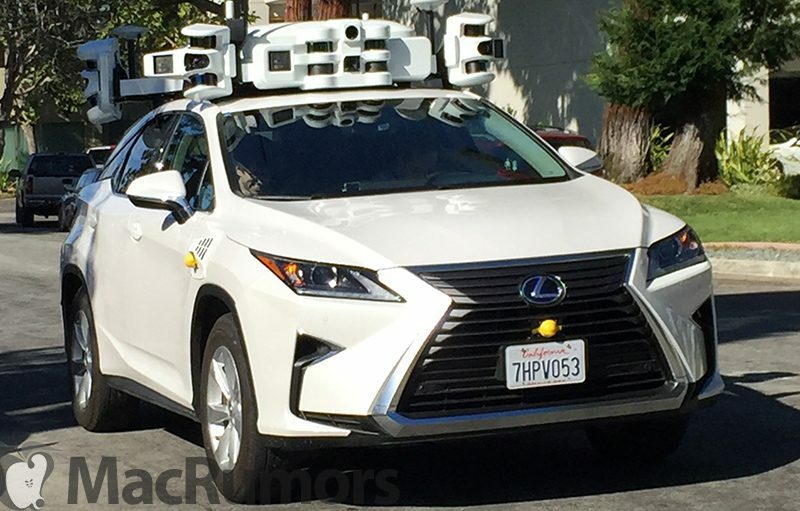 Apple has had several Lexus SUVs equipped with sensors and cameras out on the road to test its self-driving software platform since April, but MacRumors reader Amy, who lives near one of Apple's offices in Sunnyvale, California, recently spotted one of Apple's Lexus SUVs with a new LIDAR setup. 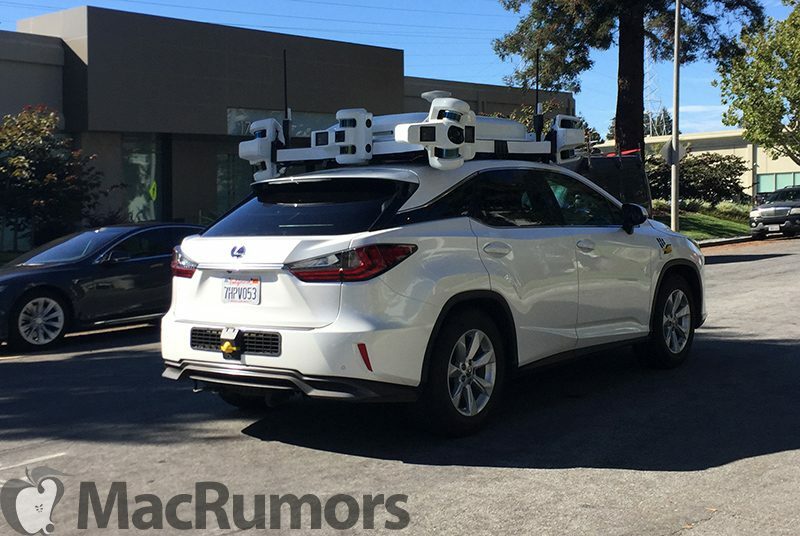 Amy sees Apple's autonomous SUVs on a regular basis in the Sunnyvale area, which was previously rumored to be the spot where Apple is conducting all of its "Project Titan" research. The Lexus in question is parked directly outside of Apple's Sunnyvale location. The vehicle has a different LIDAR arrangement than we've seen previously, with far more sensors and cameras at the top. 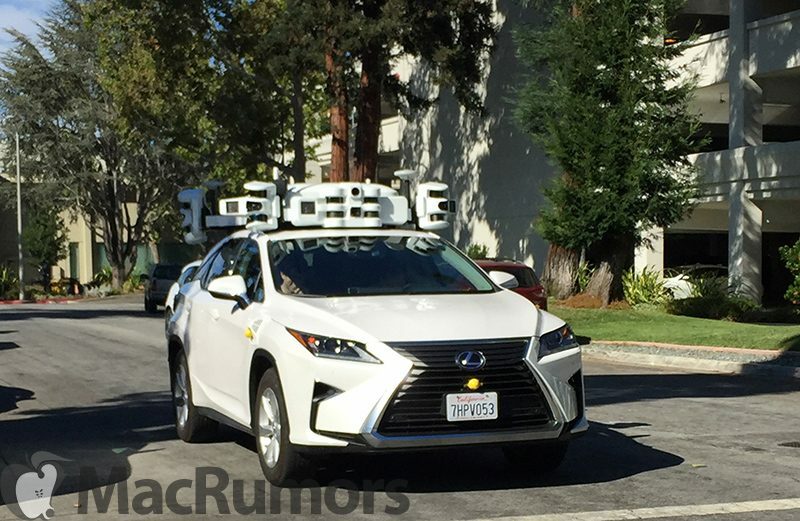 Apple also appears to have added new Lexus models to its testing fleet. Prior vehicles spotted were 2015 Lexus 450h SUVs, while this vehicle is a 2016 or 2017 Lexus 450h with a new design. 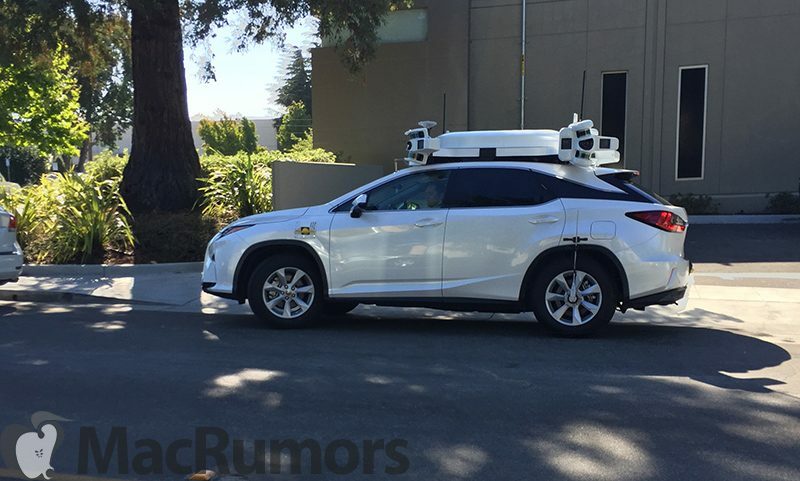 It isn't immediately clear what function the additional LIDAR sensors serve, but Apple is using these vehicles to test its self-driving software platform that's in development. 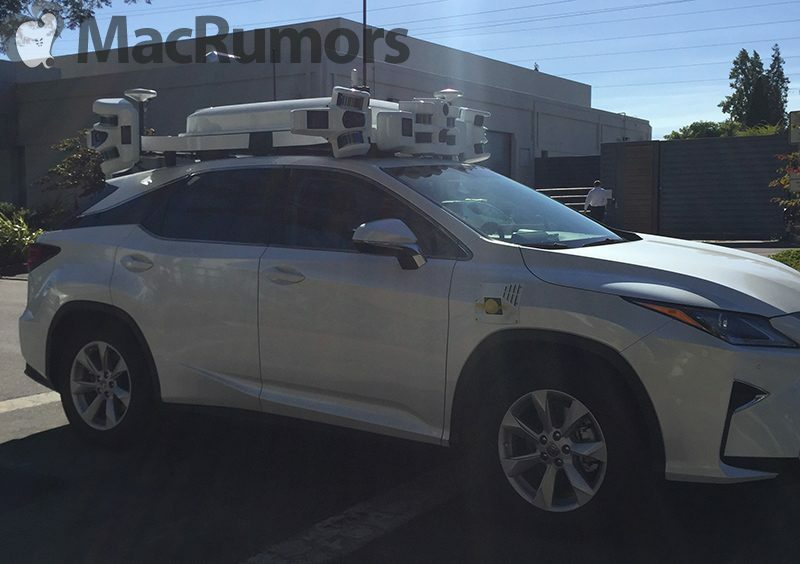 Other LIDAR arrangements have also been spotted atop Apple's SUVs. As can be seen in the photos and video, there are two main LIDAR setups at the front and the back of the vehicle, each surrounded by four other components laden with sensors and cameras. The LIDAR systems on the car are designed to send out laser beams to allow the car to accurately detect its surroundings, essentially creating a 3D map of the environment around the vehicle. GPS sensors allow the car to orient itself relative to its surroundings, helped along by radars located at the front and back of the car to measure distances to objects and wheel sensors to measure wheel movements. Cameras located near the LIDAR sensors let the car detect traffic lights, people, cars, and other moving objects. It's a highly complex system, and Apple's SUVs are collecting enormous amounts of data every second and then processing it with Apple's unique software to pilot the car. While Apple is testing self-driving vehicles, there are people in the vehicles at all times ready to take over should something go wrong. The photos we're sharing today clearly depict both a driver and a passenger monitoring the car's progress. Apple's car project started off with the company planning to develop a complete autonomous or semi-autonomous vehicle, but internal strife, leadership issues, and other problems led Apple to shift focus. Under the leadership of Apple's Bob Mansfield, the company is now working on an autonomous driving platform that could potentially be used in third-party vehicles. Along with the SUVs, rumors suggest Apple will soon test its self-driving technology in a self-driving campus shuttle designed to ferry Apple employees between different Apple offices in the Bay Area. Well, if I ever get something terribly ugly installed on top of my car, I can just say I'm part of Apple's autonomous vehicle program to save face. There is just no way this is for autonomous driving. They are up to something else here, we just don't know what yet. That is a ridiculous overkill of sensors for autonomous driving. When designing something you have redundancy. Pretty sure there are several different technologies being tested at same time. Then you can start creating the final product. There's nothing I love more than video shot vertically. I'm not buying that self driving cars are just around the corner. Spend some time on big city thoroughfares and Interstate highways, and watch the lunacy that takes place when human drivers decide you are driving too slow for them. How any AI will be able to deal with the mental cases that inhabit powerful automobiles is anathema to me. So one with Mark Wahlberg? If I was testing top secret tech in public, I'd put as many sensors atop my test vehicle as well. Deception is a common tactic employed in racing to keep engine and vehicle abilities hidden from competitors. This looks more like terrain mapping data collection. I know a guy who had a safe driving distance feature on his car. It would keep a safe driving distance between his car and the car ahead of him on the freeways. He had to turn that feature off because cars kept cutting in front of him because THEY COULD! STOP FILMING IN PORTRAIT MODE.